Grids are facing the challenge of seamless integration of the Grid power into everyday use. One critical component for this integration is responsiveness, the capacity to support on-demand computing and interactivity. 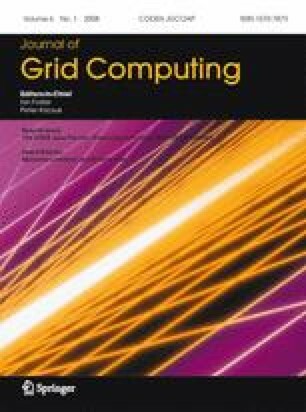 Grid sched uling is involved at two levels in order to provide responsiveness: the policy level and the implementation level. The main contributions of this paper are as follows. First, we present a detailed analysis of the performance of the EGEE Grid with respect to responsiveness. Second, we examine two user-level schedulers located between the general scheduling layer and the application layer. These are the DIANE (distributed analysis environment) framework, a general-purpose overlay system, and a specialized, embedded scheduler for gPTM3D, an interactive medical image analysis application. Finally, we define and demonstrate a virtualization scheme, which achieves guaranteed turnaround time, schedulability analysis, and provides the basis for differentiated services. Both methods target a brokering-based system organized as a federation of batch-scheduled clusters, and an EGEE implementation is described.